Earlier this week leading ticketing and live entertainment group CTS Eventim announced its plan for “the eleventh consecutive increase in its basic dividend”. Its Board will propose to the company’s AGM in early May that a dividend be distributed to shareholders for the 14th consecutive time, and that the amount to be paid would again equal 50 per cent of consolidated net income i.e. 62 cents per share (up from previous year of 59 cents). CTS Eventim can afford to reward its shareholders due to year-ending 2018 with record revenues and earnings. It continues to grow its core businesses with ticketing revenues up year-on-year to €447M (+7%), and live entertainment promotions up to €812M (+30%). Strategic investments were made in new markets and services including Secondary Ticketing (via Eventim fanSALE – a ticket auction and exchange platform), Information Sciences and Sponsorship (Eventim Brand Connect) with expectations of strong market growth in live entertainment and ticketing. Indicative of the company diversification into online services, at the tail-end of 2018 CTS Eventim also announced the successful tender for the nationwide collection of German Vehicle Tax via a 50 per cent consortium with Kapsch TrafficCom. Ticketing and promotions CAGRs (Compound Annual Growth Rate) since 2015 were 9% and 18%, respectively. During 2018, ticketing acquisitions and other increased investments were made in Germany, Italy, Denmark (details here) and Hungary, along with promoter investments and acquisitions in Italy, Spain and Switzerland. European investments drove the most significant revenue growth increases in Italy and Spain, of 149% and 111%, respectively. 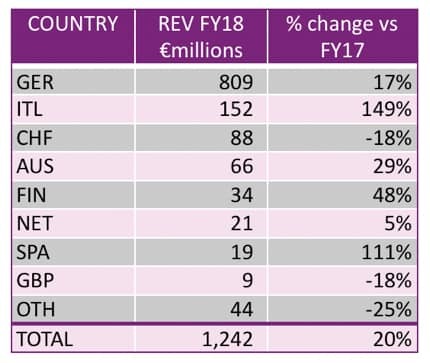 Germany remains the largest operational territory for CTS Eventim, and the growth within the German homeland (€116M or 17%) comprises ticketing (€19M) and promotions (€97M). This represents 65% of overall revenue, down slightly from 67% in FY17 as it continues to build international revenues. In part CTS Eventim has to consider growth via international expansion as its dominant German market position increasingly attracts competition concerns. The country analysis also highlights the less successful CTS Eventim operations, at least for 2018, in Switzerland and the UK. Previously the Swiss Federal Competition Commission (WEKO) had ruled against the proposed acquisition of StarTicket, and then Ticketmaster’s launch into the same territory has possibly also had some impact. Within the UK the transfer of the SMG ticketing contract from Eventim to Ticketmaster has also been an important factor in the localised decline. However, overall CTS Eventim ticketing revenue was up €29M and 7% driven by higher online conversion and increased ecommerce business, whilst promotions revenue was up €185M and 30% largely volume-driven with an increased number of tours and larger than average audience size. Gross Margin improved 12% to €341M but was slightly down as a percentage of revenue from 29% to 27%, driven by relative increase of the lower margin promotions business when compared to ticketing. Operating expenses were up 8% year-on-year, but down as a percentage of revenue to 17%. EBITDA was €228M, up €26M and 13%, but EBITDA margin was slightly down from 19% to 18%, again driven by the relative increase in the lower margin promotions business (35% EBITDA increase in promotions versus 9% for ticketing). Balance sheet was strong with 36% increase in cash and 23% increase in total assets, with Net cash (excluding client cash) up ~29%. In conclusion a robust performance by CTS Eventim and these 2018 F/Y results reveal a profitable ticketing and promotions company. Disclaimer: This article is for information purposes only and may not be reproduced or distributed to other persons without written permission. This article is not a substitute for the necessary advice on the purchase or sale of securities, investments or other financial products. In respect of the sale or purchase of securities, investments or financial products, a banking advisor may provide individualised advice which might be suitable for investments and financial products. This article is based on generally available information and not on any confidential information. We (the author(s) and publisher) believe the information included herein to be reliable, but we do not make any warranties regarding its accuracy and completeness. This article constitutes the current judgment of the author(s) as of the date of publication and is subject to change without notice. It may be outdated by future developments, without this article being changed or amended. The authors receive no compensation or hold any financial interest in the company or companies featured. In short, all/any ‘FP&A at TBF’ Insights are personal opinion only and do not constitute investment advice. All commentary, and content is for informational purposes only. Do not construe any such information as official legal, tax, investment, or financial advice. For any investment decision you should always seek a professional financial advisor.